In an already challenging agriculture economy, it may seem like this year has little positive to offer — especially if substantial winterkill of forage stands has occurred on your farm. However, with each challenging situation comes a shred of opportunity, regardless of how small that opportunity may appear. The most impactful path for improving your farm’s year-over-year margin is through aggressively managing forage quality. If your fields experienced winterkill, embrace the opportunity to implement alternative forage strategies and crop options. Experience here will prove valuable for your farm in the long run. When working to understand winterkill, recognize that freezing and thawing, minimal snow pack (insulation) and/or flooding can cause substantial alfalfa plant damage. Cold-tolerant alfalfa varieties can withstand temperatures as low as 5°F. However, with a thaw or minimal to nonexistent snow cover, the ground may reach dangerously cold temperatures and can kill off alfalfa plants by freezing. 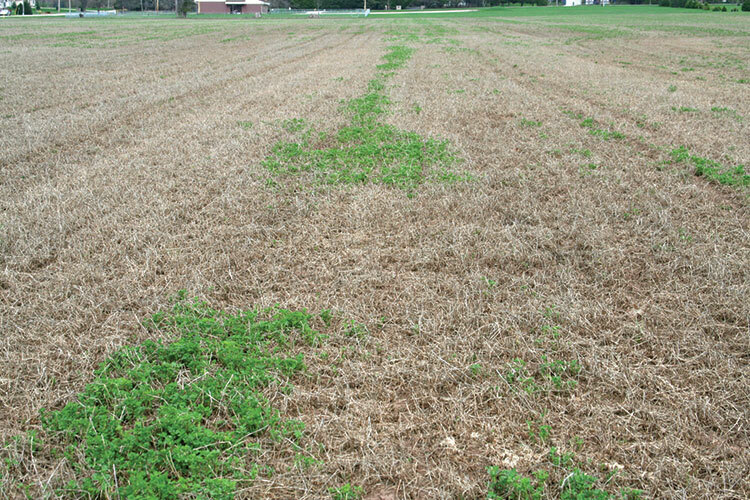 With freezing and thawing cycles, both heaving and ice sheets can kill alfalfa stands. Heaving uproots the crown and ice sheets limit air exchange with the soil, concentrating toxic metabolites at the crown and injuring the plant. Research shows us that alfalfa can tolerate up to three weeks under an ice sheet before incurring damage. With a better understanding of winterkill causative factors, reflect upon the conditions your fields experienced and then move to assess your fields’ status. Watch fields for slow or uneven growth as plants break dormancy. Research has suggested that stands with less than 55 stems per square foot are aging or injured, and yield will be depressed relative to healthy stands. When the stem count is less than 40 stems per square foot, think about replacing the stand. Use the following equation to estimate yield losses with winter-damaged fields for partial budgeting purposes: Yield (tons per acre) = (Stems per square foot x 0.1) + 0.38. For example, at 45 versus 55 stems per square foot, the tons per acre (dry matter) and dry hay equivalent losses would be 1 and 1.1 tons, respectively. At a $150 per-ton dry hay value, this could be equated to approximately $170 per-acre loss for the year. This value can then be used in a partial budget for evaluating alternative options. Unfortunately, stem counts need to be made as the crop is standing. Consult with your crop adviser and evaluate root damage prior to that. There are two options with an injured stand: Nurse the stand back to health or replace it. If the stand is young or only modestly damaged, try to nurse the stand back to health. Allow the crop to mature to bloom stage during the year’s cuttings. Waiting to cut allows the plant opportunity to replenish carbohydrate reserves and affords the plants the best opportunity to recover. Raise the cut height to allow new shoots to develop and flourish. Aggressively control weeds to avoid alfalfa competition and then fertilize the stand. Do not take a late-fall cutting. Consult with your nutritionist and discuss how this mature crop may be allocated as it will not be dairy quality feed. Seeding a high-quality forage grass (2 to 10 pounds per acre, depending on species) into a damaged alfalfa stand may be an option; however, consult with your crop adviser for variety selection and guidance. Alfalfa is difficult to reseed into an existing stand due to autotoxicity unless the stands are young. For early season tonnage needs, forage oat is one of the best options. When seeded at around 60 pounds per acre, it can yield over 2 tons of dry matter per acre. For yield and protein needs, seed peas along with the oats. Oats are not an ideal option from a forage quality standpoint as fiber digestibility is inferior relative to other grasses. If forage inventory can be stretched, planting a higher quality grass, forage sorghum, or silage corn is often the desirable choice. As a midseason harvest solution, forage sorghum, especially brown midrib hybrids, can provide greater yield relative to oats and improved fiber digestibility if harvested when immature (less than a 36-inch height). Another midseason solution, cool-season grasses such as ryegrass or meadow fescue have exceptional forage quality but may be slower to establish and not tolerate hot, summer conditions as well as sorghum. Lastly, when forage demands are not urgent, the best late-season harvest option is planting silage-specific corn. Before pulling the tillage equipment or planter out of the shed, bring your agronomy and nutritional team together to talk about what options are sound for your farm. Consider yield opportunities and balance that against forage quality using a partial budget approach. Put pen to paper and evaluate the economic impact when making final strategy decisions. Most of all, remember to stay positive. This article appeared in the April/May 2018 issue of Hay & Forage Grower on page 14.